Chairman of the Australian Board of Missions. OUR TRUSTY COMRADES--HOW SHALL WE EVER REPAY THE DEBT? Splendid Missionary Men and Women. In speaking of our missionaries I do not want it to appear that I regard them as being superior to the missionaries of other Churches. From my observation of the work of the London Missionary Society I had confirmation of what I had always believed to be true, viz., that in every Missionary Church there are and always have been some outstanding missionary personalities. As I think of those who represent us in the Diocese of New Guinea I have grateful memories of a group which I would describe as really great missionaries--twelve or thirteen men and women. As one who had been a missionary h one of our greatest Mission Fields I am free to confess that I went to New Guinea with the hope that I might be allowed to be a spiritual help to our missionaries, and with the purpose of studying them with care. They gave me much opportunity in both ways. I had been told that I should find a superiority complex, exemplified particularly in the Sacrament of Unity in which it had been stated to me that the missionaries are careful to communicate first. I shared in the Sacrament in every Mission Church but one. I never once saw the least approach to this kind of superiority. Everyone communicates together, and it was a picture to be remembered to see white and brown worshippers kneeling together, men and women and boys and girls of both colours, coming and going without distinction. There are of course difficulties in social adjustment. I do not suppose that there is a Mission Field in the world where this is not so, and particularly in areas where small numbers live in complete isolation as they do in Papua. Nevertheless the victories achieved in this particular matter are often splendid in every sense of the word. I found one woman, Sister Ida Kent, in charge alone of a large district and work formerly in the care of a white priest, and doing it in a spirit of loyalty to the native priest. This fine brave soul can do anything from carpentering to major operations. But she is very tired. There are three or four men missionaries with a background of experience and learning that has made them outstanding as linguists and men with a know ledge and appreciation of the people and their psychology that I venture to think is unrivalled anywhere whether at home or on the field. If it were not heresy even to suggest it I think it would be a wonderful thing if we were able to get one of these men to come home and be the teacher of missionary candidates. 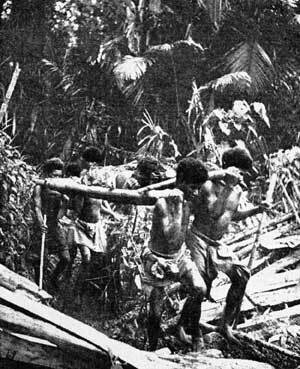 There were many sides of missionary work that called out admiration, but I think the chief one was the illustration of the transformation of life as seen in Papuan dancing. The Papuan loves dancing as much as the Australian does, and he always sings when he dances. He also loves "dressing up," even more than does the Australian. In heathen days when no death was ever regarded as a result of natural causes and when often it was considered that vengeance for a death had to be visited upon someone, dancing was often connected with triumph over an enemy or the exorcising of evil spirits. Today in Christian areas all this is changed. The song of the dancers now has as its subject, birds, or flowers, or fishes, or paddling a canoe, or hunting, and various dancing figures are appropriately acted. I watched the joyous laughing faces of the dancers, and I realised that I was witnessing one of the triumphs of Christian evangelisation. They retain their dancing and many other national customs, but these are transformed, and fear and dread are changed into happiness and joy. When you see these things you realise how true it is that missionary work is a science. I saw a number of examples of successful missionary strategy. It was a thrill, for instance, to discover that the principal Mission Stations on the coast have been established at the natural gateways to great areas of population of which the evangelisation is still in the future. There are twelve major Mission Stations. Not only are these so placed as to be able to control the still unevangelised coastal areas, but stations like Taupota, Boiani, Mukawa, Wanigela, Eroro and Mamba, have been placed at the natural opening to great mountain areas of operation. Whether or not the establishment of these Stations at these spots was of set purpose I do not know, but in talking to senior missionaries I became convinced that statesmanship of that kind has distinguished our leading missionaries from the first years until now. Within the present boundaries of the Anglican Mission there are four great unevangelised valleys, Goilala, Chiruma, Managalasi and Musa; and the natural bases for the evangelistic drives into these valley are respectively the Mamba, Sangara, Eroro and Wanigela. If we of the Australian Church can man the present stations to adequate strength it will be possible to complete the evangelisation of these vast spaces within a comparatively short time. Adequate staffing of a Mission Station in the opinion of senior missionaries consists of a white priest and teacher and nurse and trained layman, the latter having a knowledge of building, plumbing, painting and cement work. In addition there should be at least one extra or relay group of these four, free to enter unevangelised areas and to be a special team to go on evangelistic expeditions. Senior missionaries are of one mind in believing that the programme that stands in front of the Mission is first that of bringing the present stations to adequate strength, second, occupying the unevangelised areas within the present Anglican Mission, third, going afield into further areas. In the light of this the immediate need consists of four white priests, seven nurses, nine white teachers, fifteen trained laymen, a marine engineer, a trained agriculturalist and a doctor. My reckoning of these is based on the present staff and those who ale about to go. But when it is realised that several of the senior missionaries of today, are quickly growing old, the challenge and the responsibilities of the Home Church cannot be over-estimated. It seemed to me as I studied the life of the Papuan Church that there are several lines of action that will be inevitable and that will have their own interest for us. Several times Archdeacon Romney Gill said to me, "What we need now are specialists," and he talked a good deal about that. What I thing he meant was that every missionary of the future will need to be a trained person in one direction or another--in education, in medicine, in the pastoral ministry, in evangelism or in craftsmanship. There is still a great deal of translation work to do, and although it seems certain that English will be the lingua franca of the future I became mole and more convinced that no missionary can be expected thoroughly to understand and appreciate the thought-life of the Papuan unless he is able to converse with him in his own tongue. I hope that as the staff increases it will be made compulsory for every missionary to master one of the languages and to be treated as a probationary missionary until an approved language examination has been passed. The observance of such necessary regulations as these have of course not been possible during the last few chaotic years, but I am certain that the future calls for at least language effectiveness. The Rev. Dr. Capell of the department of Anthropology in the University of Sydney is giving our missionary trainees a very valuable introduction to Wedau. My judgment is that if they are expected to become proficient in Wedau, and if that proficiency is tested by examination, the foundation will be laid for a most valuable missionary ministry. The language traditions of the Mission staff of the New Guinea Mission are of a wry high order and will need to be developed in future years. I am certain that this is true even for teachers whose work is largely in English. I took the opportunity whenever possible to listen to lessons being given by English teachers, and I came to the conclusion that generally speaking only those who had mastered a language were able to do justice to that sacred principle of teaching which demands that a teacher will proceed from the known to the unknown. In other words successful teaching must be based upon a foundation of what the Papuan pupil already knows. It is impressive to see how often men have been carried on to higher standards of spiritual and intellectual understanding than the women. Wherever it was possible I was given opportunities of meeting and addressing the Guild of S. Mary. No missionary considers that it would be appropriate and wise yet for the Guild of S. Mary to be affiliated with the Mothers' Union, for the moral standards of the latter have quite evidently not yet been attained by the former. The whole great question of initiation to adult-hood calls for much sympathetic understanding and study. Until that is done I have judged that it is not likely that Papuan women in general will have the courage and the spiritual strength to rise to the highest standards of Christian womanhood. The same is true in a lesser degree of the boys and men. I may be wrong, hut my judgment is that the secret of spiritual and moral progress here is wrapped up in a successful movement to uplift womanhood in general. Co-operation and Co-ordination in Educational and Medical Work. At present through force of circumstances each of these workers is practically a separate unit. Both these sides of the work must necessarily be regarded as separate departments, the members of which will work in co-operation, under professional guidance, according to a syllabus and under co-ordinated direction. On the medical side, for example, a nurse trained in Queens land has been taught to use different drugs from a nurse trained in Victoria. Hence when a nurse who is a separate unit sends down her order, and after receiving it is succeeded by a nurse trained in another State the latter is likely to be at sea, and not to have use for the equipment left by her predecessor. After all, we probably all know how local are the views and methods of both doctors and nurses in the great profession. In the sphere of education a loyal acceptance on the part of everyone of the syllabus au curriculum of the Government Department of Education will soon be required. From the secular point of view that is likely to make heavy demands upon teachers, and missionary teachers will need to work in close co-operation and under the guidance of a missionary member of their own profession, if they are to enter fully into the spiritual and moral opportunity which will be theirs. Through loss of missionary leadership and other war time factors it is widely felt that the spiritual tone has been lowered. Hence its renewal is to be the first great united effort of the Church. We in the Home Church will need to remember this and to stand behind our brethren with our prayers, and possibly with our gifts of the books and aids that they will need. through which I went. It will be sufficient for me to say here that in the presence of a great congregation and at the Bishop's invitation I dedicated the spot where Mavis Parkinson and May Hayman were slaughtered, that I met there the old village chief who had done his utmost to save them, and that Christian Arek, my voluntary batman, who was the lad who found their bodies was there. I landed with the Bishop at Gona Mission and helped in ministering to a great multitude of natives of mixed loyalties who had come together, I think, for the first time, and sat round the ruined altar and font of the old Mission Church and round the bomb craters and Japanese dug-outs and fox-holes, while all about were flowers springing up from where the Mission garden had been. It was the great moment of re-union between James Benson and his people. Seeing him in their midst was a deeply moving occasion. I saw many of the Jaggarata people to whose leaders after being condemned to death by the Army authorities the Rev. Luscome New man ministered, and to a majority of whom he was able to give the rite of Holy Baptism, including Ambogi their chieftain who formerly was the terror of the district. You remember that these condemned leaders were asked when they stood at the gallows if they had anything to say, and that they all gave Christian witness, and that Ambogi commanded his people to go to the Mission and learn of Christ. The consequence is that everywhere through those jungle areas the Jaggarata race is asking for teaching, and it now lies right open to the impact of the Gospel. I had seen nothing like it since I worked in the mass movement areas in South India. I twice visited the gloriously situated Soputa Cemetery where there were 1728 white crosses, the vast majority of the names of which were Australian. In that jungle environment, close to the late headquarters of General Herring and in the heart of some of the most fearful fighting areas, with the terrible kunei grass waving nearby and the impenetrable jungle almost all round, one could not stand upright. We had to kneel down. Alas, because it is felt that tourists of the future cannot be expected to journey across to those northern areas it has been decided to move the remains lying in the Soputa Cemetery across to Moresby. Those poor remains had already been moved two or three times, and I witnessed the beginning of the final gruesome business. It seemed to me utterly unnecessary and to be one of the major crimes of authority against all that is appropriate and worthy. Some Impressions made during nine weeks of Journeys.